Can’t remember the last time you had a relaxing evening cooking a meal at home? Try these simple strategies to turn your mid-week dinner stress-fest into a quick, easy & enjoyable part of your night. Cooking homemade meals at dinner each night can be stressful. Between work, family, exercise and life, we don’t often leave much time for making healthy meals at home, let alone living up to the standards of master-chef style feasts or ensuring our dinners are nutritious & meet the needs of the whole family. Did you know that 3 in 5 Aussies find it stressful deciding what to cook for dinner & more than two thirds of Australians feel that they’re too busy to find recipes their whole family will enjoy?! * I know I’ve had my fair share of stress attacks trying to work out what I’m going to cook for dinner after arriving home late from work and worrying if everyone will eat it. Regardless of this anxiety & stress that comes with cooking at home, us Aussies still value homemade meals. We know that cooking nutritious, wholesome food at home is important to our health & we can’t live off takeaway pizza or Thai every night. Plus homemade meals are a lot cheaper than ordering in each night and it also sets a good example for the kids. Plan You Meals Ahead Of Time – at the start of each week, choose your meals for each night of the week & write it on a planner. You can download my meal planner template here. Place it on the fridge or somewhere visible that the whole family can see. Involve your family/household in the process – sit down with your family and talk to them about what type of meals they like and the different things they want to eat at dinner time. You might be surprised at some of their healthy choices. Also find out what they are willing to try. Show them some recipe ideas and let them choose some of the meals you cook. Allocate time for cooking – cooking at home can be even more stressful if you’re trying to do a million things at once. Instead, allocate a set time for cooking and focus solely on that. You will be less likely to make a mistake and burn things & it will be a lot less stressful. Keep your kitchen clean & organized – a messy kitchen will create stress, so start with a quick, 5 minute clean up before you cook by simply putting things away and clearing some bench space to prep & cook your food. Then clean as you go so you’re not left with an explosion of pots and plates at the end. Have set tasks for family members – get your whole household involved in the prep, cooking & cleanup. Your kids could be involved in setting the table or washing up or your partner could have a set night for cooking each week. 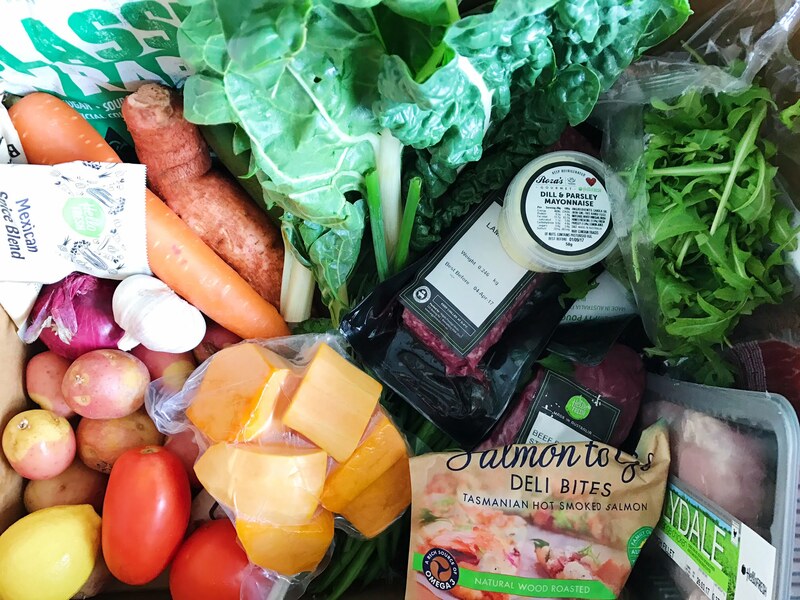 Use a meal kit service – take all the stress out of cooking at home with a fresh food delivery service. 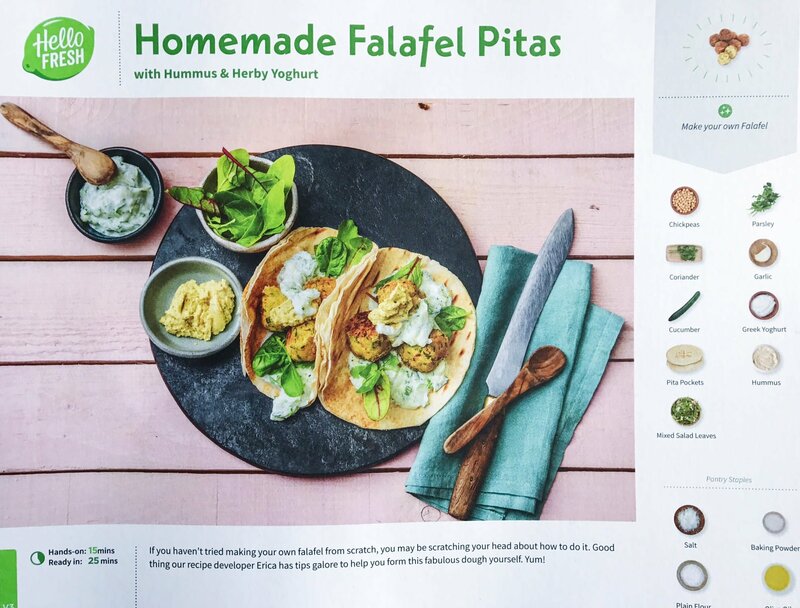 I regularly use HelloFresh which delivers everything you need for weeknight meals, from pre-portioned fresh vegetables, grains, fish and spices (meaning no waste) to carefully planned, wholesome recipes, so all you need to do is cook; no planning or shopping. 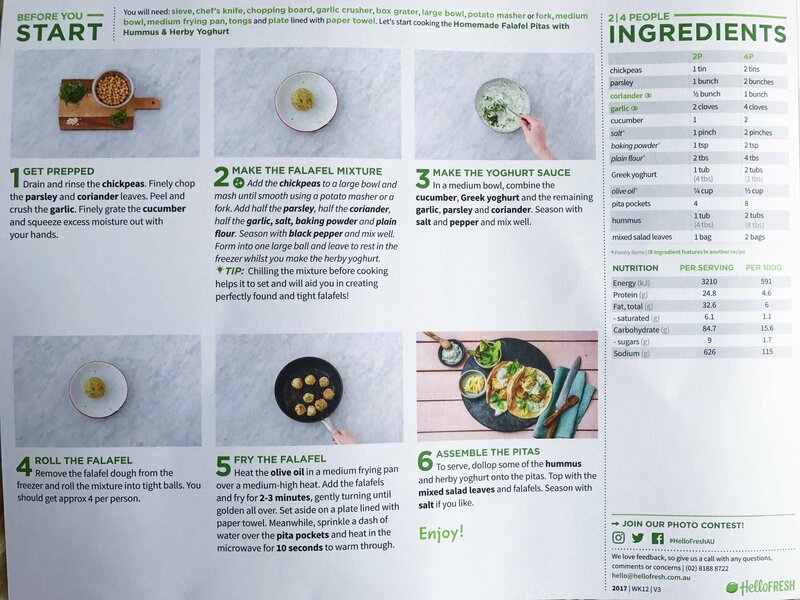 The Hello Fresh meals are developed by Dietitians, so they are all healthy and nutritionally balanced & they always a great variety to help broadened your recipe repertoire.HelloFresh offers three box options including a Family Box (suitable for young families that feeds four or five people for four nights), a Classic Box (feeds two to four people for three or five nights), and a Vegetarian Box (for two or four people for three nights). I order the Veggie Plan involves an abundance of seasonal produce, hearty grains, and vegetarian friendly proteins. I used all the recipes cards that were in the box this week and my favourite was the Homemade Falafel Pitas. And if you eat meat, then the Classic Plan is a great option as you’ll receive the largest variety of recipes with a handpicked selection of meat, fish, produce, and grains. 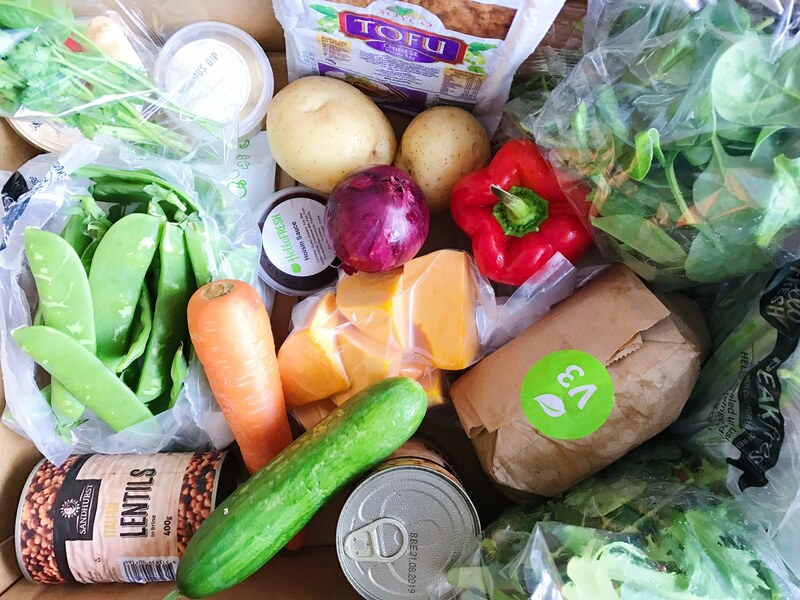 For more info & to order a HelloFresh Box, visit https://www.hellofresh.com/tasty/. You can use my code “Nourish40” 40% off your first box! So now that you know how to make your dinner times less stressful, go get cooking! 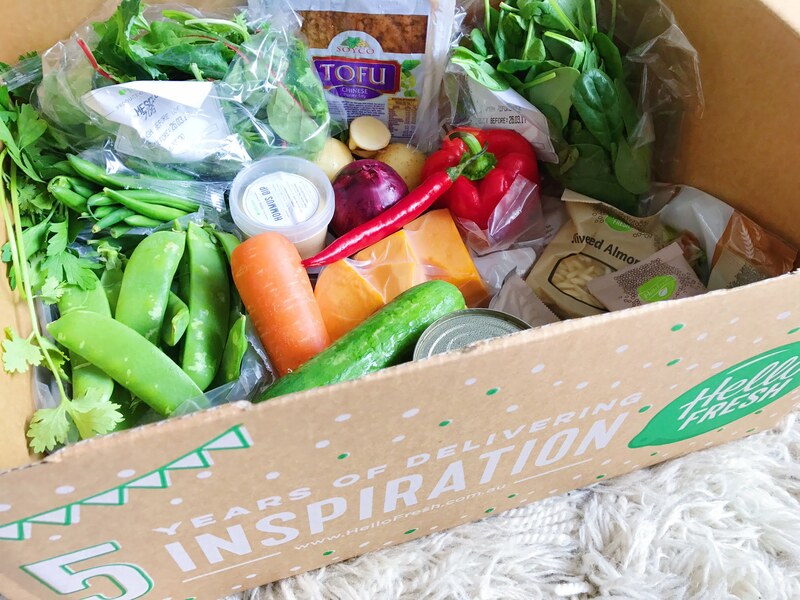 Note: This article was not sponsored but boxes were gifted by Hello Fresh for review purposes. All opinions are my own and not influenced in any way. *Research by McCrindle 2017.